The much awaited Samsung Galaxy S5 which was unveiled in Mobile World Congress 2014 will be released worldwide next month. In Bangladesh, to get the device from the official store, we had to wait for around 5-6 months! It seems this time Samsung Bangladesh will be in the same train with the other nations to release the hyped device around the same date. The Galaxy S5 comes with a 5.1 Super AMOLED display with a 1920 x 1080 resolution which is just .1 inches larger than its predecessory. The device is armed with a Quad-core Snapdragon 800 processor which is clocked at 2.5GHz and has a 2GB RAM on board. 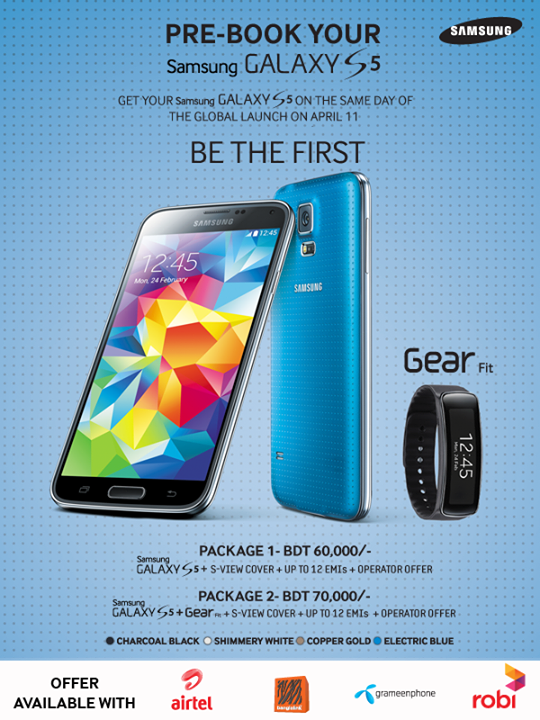 The S5 comes with a 16-Megapixel camera which packs more features than the previous Galaxy S4. At the rear, Samsung has added a heart sensor which will instantly measure the user’s heart rate if the finger is placed on it. Most importantly, the device has the fingerprint scanner feature for better security and also is dust and water resistant. 1. Samsung Galaxy S5 with Free S-View Cover. The Galaxy S5 would be releasing in 4 colours: Charcoal Black, Shimmery White, Copper Gold and Electric Blue.